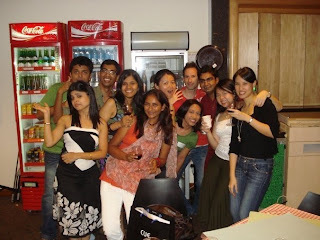 The NUS MBA Freshers Party was a fun-filled night at the University Cultural Centre (UCC) to welcome the new batch of students on 21st August 2009. Red, Yellow, and Green were the colours of the day, and what seemed like a quirky dress code for a party turned out to be a great conversation starter. For these colours were laced with sinister meanings, ‘available’, ‘taken, keep away’ and the most amusing of them all ‘complicated’!! The event: Fresher’s Party organized by the Student Activities Club at the University Cultural Centre (UCC) on 21st August. It was one of the first fun events organized by the Students’ Council to welcome the new batch of 2009, and what a party it was!